[ADVERT]Looking for something different to do on your weekends? 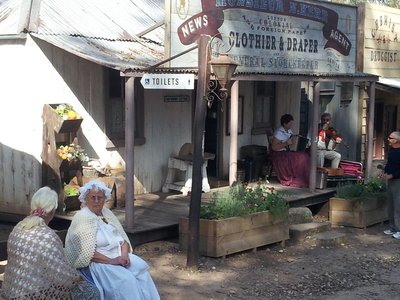 Why not grab the family and take a step back in time at the Australiana Pioneer Village. In the picturesque setting of Wilberforce (about 10 minutes from Windsor), this small model pioneer town has been but together with real historical buildings from surrounding areas to create an utterly charming historical experience. Right from the get-go, I was thoroughly impressed by the friendliness and knowledge of the volunteers who run the village every Sunday. Dressed as pioneers themselves, the amount of information they know about each building and its history seems to be endless and they are more then willing to share it all with you. If you would rather find it out for yourself, a map and pamphlet on arrival combined with no end of informative signs, will help you piece together just what life would have been like in each of these buildings when they were in their prime. All in a day you can, visit a working blacksmith, get your face on a wanted poster, go for a ride in a horse and cart, crack a whip, visit a school room from the 1880s and find out what John Wayne and the TV show Wild Boys have in common with the place- not to mention discovering where each place came from, who had lived there, and what it was used for. Several special events are organised throughout the year- including ghost tours, craft classes and markets. 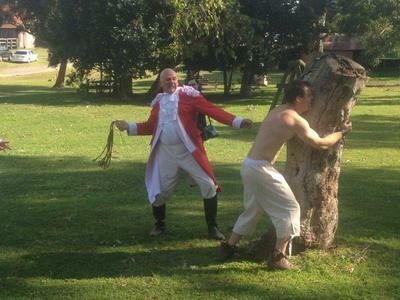 On the day I went I was lucky enough to experience a convict trial re-enactment. For a full list visit the website. Once your stomach starts to growl, there's several lunch options. The first is to bring your own picnic and soak in the scenery in the large picnic area. The other two are the small cafes serving a range of very traditional Australian pioneer food items such as damper and Devonshire tea, as well as a few larger meal items- all simple but very satisfying. A day out at Pioneer Village is very affordable. Entry is only $5 for adults and $3 for children. If you do choose to buy food you won't spend much over $10 for the larger meals and well under for afternoon tea. A range of antiques, home-made nicknacks and (most importantly), bags of lollies are on sale for very reasonable prices. 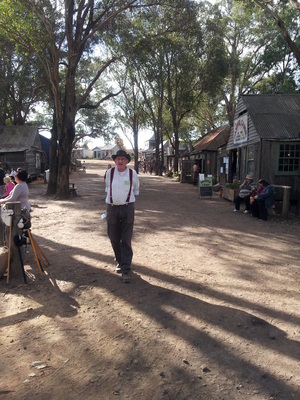 The Australiana Pioneer Village is a fun day out (and easy on the wallet) that is enjoyable for all ages. For many, getting there may take a bit of time, but the unique experience is worth it. For more information visit the website. Honestly, I was so impressed by the way they had it organised. I'm planning to take my Grandma when she comes to visit! Went today for Australia Day and it was fantastic. My children enjoyed every minute as well, especially the penny farthing bikes they could freely ride. Sounds interesting! itching to take my family down! Do you know if it will open on Saturdays soon? That would be great! Not sure about that but trying to find out for you- watch this space! Went there today, was a warm day, but had a great day. Some great history to be seen.